A couple of weeks prior Wattbike sent over the new Atom for me to try and I received a hell of a lot of questions about it, so I thought I’d put pen to paper (so to speak) and let you guys know how I’m getting on. As I only took delivery of it so recently (and I’ve been travelling and racing for some of that time) this isn’t intended to be a full review but rather a collection of my first impressions. However I do feel that immediate reactions are worth noting as they can frequently be hugely insightful. 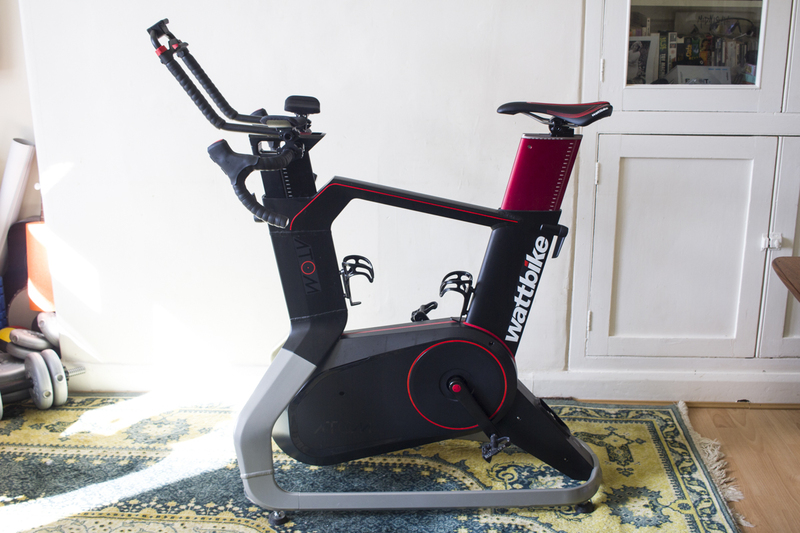 Wattbike, a British company, have been making indoor trainers since 2008 when they launched at the World Track Championships and have since been synonymous with high-end, super accurate elite training. Even as recently as a few years ago, I would have thought of a Wattbike as way more tech than I really needed but as I’ve progressed with my cycling and become more obsessive about training. I’ve moved from working with just heart rate to training with power and I’ve gone from cycling purely outdoors to getting a basic turbo trainer and then finally a technologically advanced smart trainer and a Zwift membership. 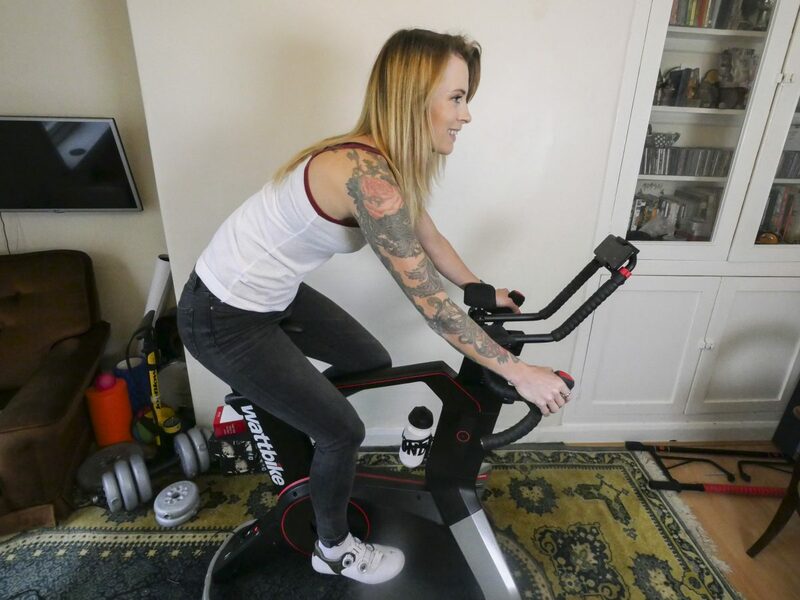 The original Wattbike, the Pro or Trainer has been used for a long time by Team GB and is the kind of device you may well have seen at high end cycling studios over the past ten years. It clearly has a lot going for it but the new ATOM is different in numerous way and in my opinion, is far more attuned with the way people want to train these days. 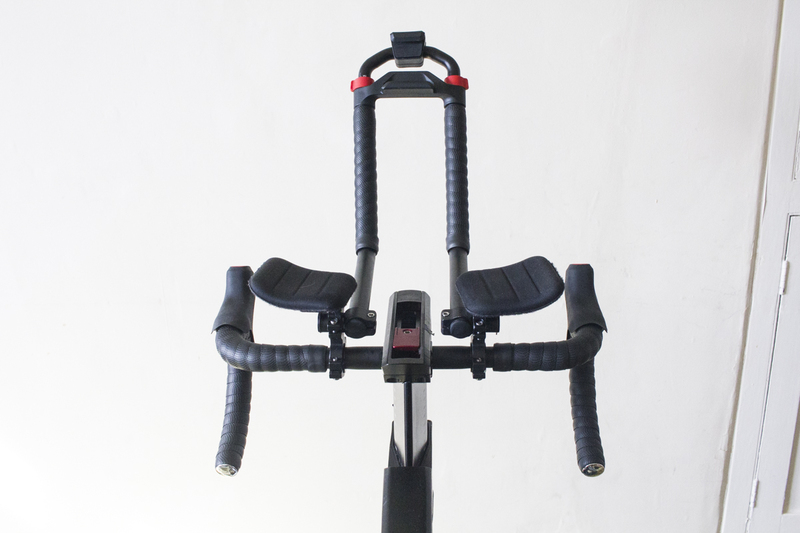 Like the original Wattbike, the ATOM is really accurate, giving you separate left and right power readings. I haven’t got the data here for just how accurate so you’re just going to have to trust me on that one and return for the full long-term review when I’ll have got my act together and found out. Whereas the Pro/Trainer is more like a spinning bike, both in terms of geometry and how you adjust the resistance, the Atom is a smart trainer, which is controlled via a smartphone or tablet. Once plugged in you can use it with a number of training programmes or apps such as Zwift, Wattbike’s own app or Trainer Road and follow your own workout, join a ride or race or using one of the structured sessions on your app of choice. So first things first, fit. 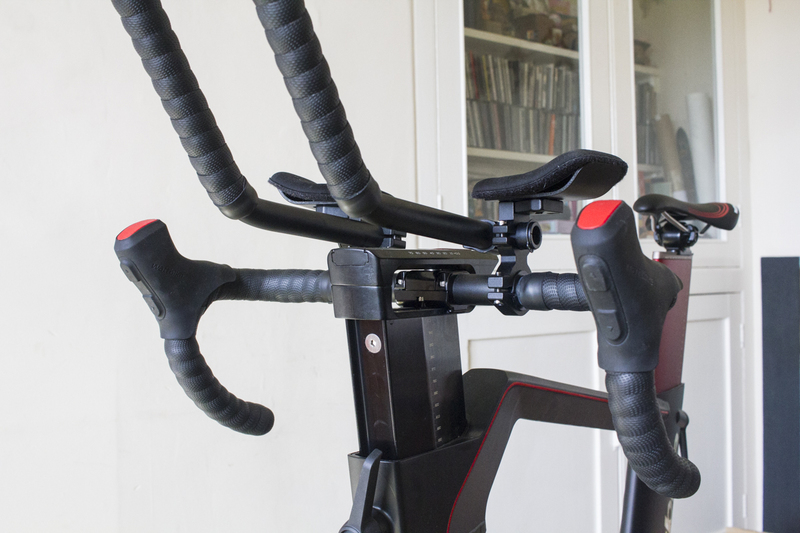 It’s super easy to adjust the bike so it feels as much as possible like the bike you usually ride, simply by taking a tape measure to your road bike and setting the Wattbike up identically. 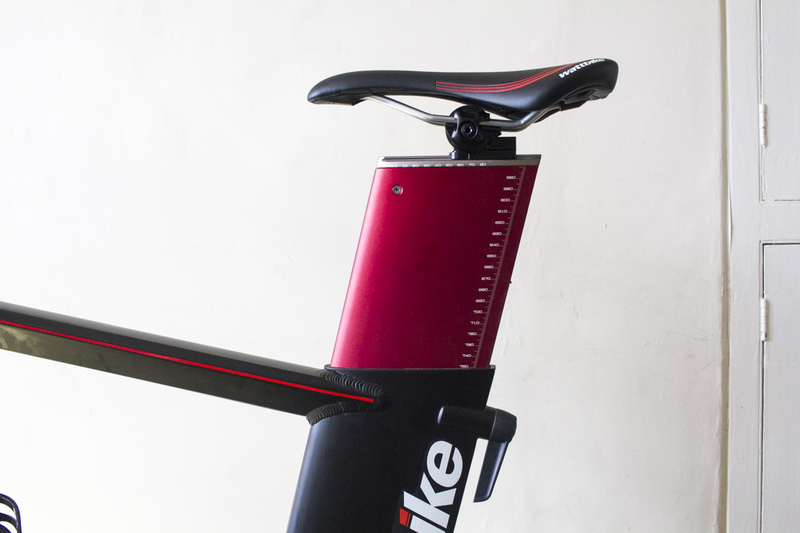 You can move the saddle up and down with a handle, ditto the stem height and that takes a matter of seconds. You need an Allen key to move the saddle backwards and forwards and to adjust the reach by moving the stem. Still, it’s simple to do. What’s less simple is adjusting the tilt of the bars. It’s such a pain to do that I gave up; you have to undo a whole bunch of bolts then there’s no clear way to put it all back together at the right angle. Tri bars aren’t something I’ve used before but they feel really good for long rides and I enjoy being able to settle down and put some serious time in on them. 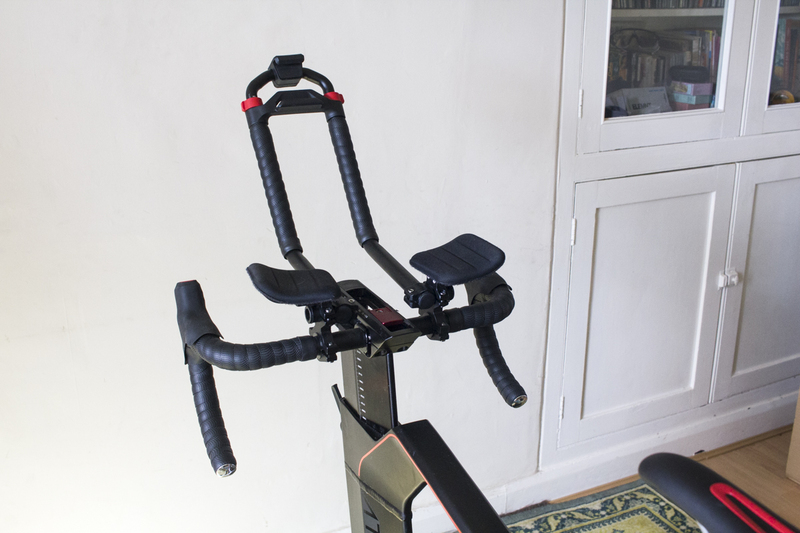 As the fit is really good, in many ways the ATOM feels like a real bike – certainly it’s not like a spinning bike which generally feel too upright. The Bottom Bracket is ever so slightly larger than on my bike but it’s not really an issue. Pedaling, it feels not dissimilar to a smooth bike – so if you put in a big crank, momentum kicks in like it would on the road and you feel like you’re rolling. In other ways it doesn’t feel like a bike. It’s so beefy and solid that there’s no compliance or flex like you’d get on an actual bike. And of course there’s no side-to-side movement. Honestly, that’s fine by me because when I’m training I just want to put out the right amount of watts for the right time. When it comes to gears, you’ve got a full set of 22 that you can change using buttons on the supplied hoods/shifters. Changing gear doesn’t feel anything like it does on a bike because you don’t get the ‘clunk’ feeling you get with a mechanical groupset. It just takes a bit of getting used to. There’s also a slight delay when shifting which can mean inclines on Zwift take you by surprise if you aren’t paying attention – the gearing suddenly feels really too hard and you have to try and pedal through that and get your cadence up again. I’m intrigued as to how the delay will pan out in a Zwift race – you’re only talking a couple of seconds but if someone attacks and I want to ‘jump’ will that be an issue? We will see. I haven’t yet fully explored training with the Wattbike app, nor with Trainer Road so I’ll delve further into resistance on hills and whether there’s an issue of delay when I write my full review in a few months. As I mentioned, the ATOM connects via a smartphone, tablet or computer. It doesn’t work with my iPad because it’s an antique so you’ll need something decent! I use Zwift a fair bit as all my Training Peaks workouts go straight there for me so it’s super easy – I just set the trainer on ERG mode and the resistance adjusts to match the intervals. I find this a kind of relaxing way to train; you barely need to think as you don’t even have to change gear. You can also use the Wattbike app to control the trainer and this gives you a lot of real time data such as insights into your pedaling efficiency. I’ll be looking into this more over the coming months. Getting the ATOM connected is seriously easy and works every time. It’s far quicker and more reliable than the other smart trainer I use. I open Zwift, click to pair and it’s done in about five seconds every single time. As I mentioned, I always thought Wattbikes were just for pros and high end cycling studios but now that turbo style smart trainers are so popular, getting a Wattbike has begun to make more sense to me. Yes, it’s still more expensive than a regular smart trainer but not by as much as you’d think and don’t forget, you won’t be wearing out your bike or any of your components. I love how it’s always ready to go. You just jump on and ride; there’s no setting your bike up or changing your wheel, something which might seem quick but can add to the faff of indoor training. The fact it pairs immediately is fab. The bike feels really comfortable and sturdy so for some reason, I’d rather sit on this thing for a couple of hours than on my turbo trainer. I’ve still many hours to put in on this machine before I can give you guys a review with greater detail but my first impressions are favourable and I’m looking forward to putting it through its paces as I train over the coming months.